The BJP may have won Assam for the first time with a handsome margin, but its dream of having a majority in the Rajya Sabha, considered crucial for the party to push what it interprets as "economic reforms", is unlikely to materialize before the 2019 Lok Sabha elections. A report by a data analysis site, has said, the elections to the five assembly seats -- Assam, West Bengal, Tamil Nadu, Kerala and Poducherry, "will not have a significant impact on the numbers in the Rajya Sabha." 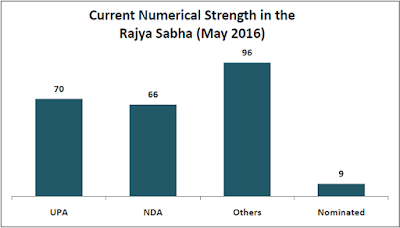 The analysis says, "The NDA cannot expect to gain even a single seat in the Rajya Sabha from these five states, before the 2019 Lok Sabha election", adding, as for the UPA, it "will lose two seats, and other parties will gain two seats from these states by 2019." The analysis admits, "Though the BJP won the 2014 Lok Sabha election with a clear majority, it has been finding it difficult to pass bills in the Upper House or the Rajya Sabha." One of the most crucial bills it had to drop because of lack of numbers in Rajya Sabha was an amendment to the Land Acquisition Act, 2013, in order to allow quick disbursement of agricultural land to industry. Another important bill pending nod is the Goods and Services Tax bill. The analysis, by Rakesh Dubbudu, says, "Since the Rajya Sabha members are elected by the MLAs in states, Congress had better numbers in 2014 to start with. The Rajya Sabha members are elected by the method of proportional representation by means of the single transferable vote (STV)." He adds, "Each state has a fixed number of Rajya Sabha seats. Members keep retiring after their 6 year tenure and elections take place as and when there is a vacancy." Today, out of the 241 members of the Rajya Sabha, 70 belong to the UPA, 66 to the NDA, 96 to others, and 9 are nominated. The bulk of the others come from the regional parties like SP, BSP, AIADMK, Trinamool Congress, BJD, JD(U), CPI(M) etc. 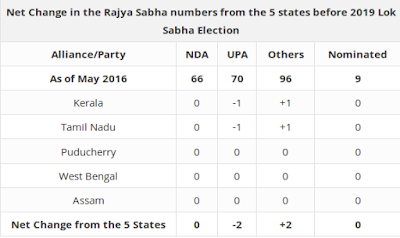 A state wise analysis of the five states which went to the polls suggests that Kerala sends 9 members to the Rajya Sabha. "Out of the 9, three are due to retire in July 2018 while the rest of the six will retire after 2020", the analysis states. Of these three, two are held by the UPA while one is held by others (LDF). "Based on the current results, the UPA will be able to retain only 1 seat while others (LDF) will win two seats", the analysis says, adding, "Thus, the net change before the 2019 Lok Sabha Election will be UPA (-1), Others (+1)." As for Tamil Nadu, the analysis says, it sends "18 members to the Rajya Sabha. Only 4 of those seats will see a re-election before the 2019 Lok Sabha election. Three of the 4 seats are currently held by the UPA while one is held by others (AIADMK). Based on current results, UPA will be able to retain only 2 out of the 4 seats while others (AIADMK) will win the rest of the two seats." The net change, here, before 2019 Lok Sabha elections will be "UPA (-1), Others (+1)", the analysis says. Puducherry sends just one member to the Rajya Sabha who is currently from AIADMK. "His term ends in 2021. Hence there will be no change in the numbers before the 2019 Lok Sabha elections", the analysis says. As for West Bengal, it sends 16 members to the Rajya Sabha. "There will be two re-elections before the 2019 Lok Sabha election. The first one will be held for five seats in August 2017. Currently, only one of these seats is held by the UPA while the remaining four are held by Others (Trinamool Congress and CPM)", the analysis says. It adds, "Based on the current results, four of them will be won by Trinamool Congress while the remaining seat can go to the Congress if the Left parties support it." Further, "The second re-election will take place for 5 more seats in April 2018. Four of these are now held by the Trinamool Congress and the remaining is held by the CPI(M). Based on the current results, Trinamool Congress can easily retain the four and the fifth one might go to the Congress or the Left depending on their agreement", the analysis points out. It adds, "In effect, there might not any change in the numbers at the national level." Finally, coming to Assam, which send 7 members to the Rajya Sabha, the analysis says, "The nearest re-election will happen in June 2019, by when the 2019 Lok Sabha election will be over. Though the BJP led NDA will win a few seats after 2019, they cannot hope to gain any seat before the 2019 Lok Sabha election." 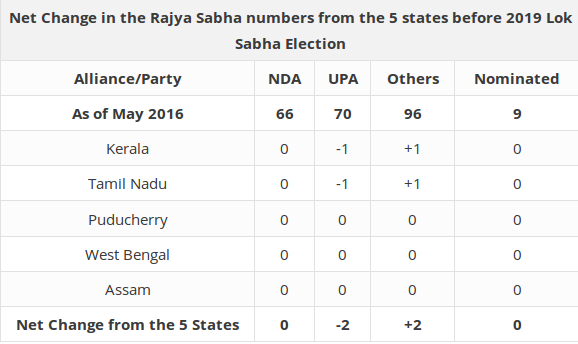 Thus, the analysis safely concludes, "While the Congress has lost both Kerala & Assam in these elections, it would not have a significant impact on the Rajya Sabha numbers from these five states."